MSc. Neuro Communication Disorders- The University of Sheffield, U.K.
Foundation Applied Behaviour Analysis Certified- Dubai, U.A.E. 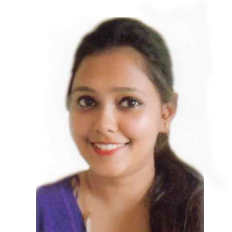 Oral Placement Therapy (Level 1) Certified, TalkTools, U.S.A.
Shreya is an enthusiastic Speech Therapist and Audiologist graduated from SRMC Chennai. Having globetrotted for a couple years, gaining training and experience in paediatric speech and language disorders, she has returned to her home country to extend her services in a multi-disciplinary rehabilitation centre. Graduated with a degree from the UK, she is specialized in the diagnosis and intervention of adult cognitive disorders. She has had the opportunity to learn and work with healthcare facilities across three different countries, including varied work settings such as COM-DEALL (structured organization for rehabilitation of children with Autism), VidyaSudha (training centre for children and adults with Special Needs),Vasantham (school for Children with Special Needs), The State Resource Training Centre, Chennai, NHS Sheffield, Behaviour Enrichment Dubai (Paediatric multidisciplinary training centre for special needs). Her training in Applied Behaviour Analysis (ABA) helps her analyse and provide behaviour management where required. She truly believes that neurological rehabilitation goes beyond diagnosis and cure; to understand and help with the psychological consequences of disability as well as the social milieu in which the disabled person has to function is paramount.